V-Dem is an international effort to provide the global community with the world’s most comprehensive, accurate and detailed democracy ratings, with institutional homes at the Kellogg Institute for International Studies at the University of Notre Dame and the V-Dem Institute in the Department of Political Science, University of Gothenburg, Sweden. 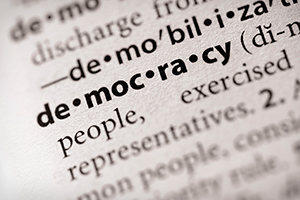 Taking a new approach to conceptualizing and measuring democracy, V-Dem is a collaboration among hundreds of scholars across the world, including many connected with Kellogg. According to Notre Dame political scientist and Kellogg Faculty Fellow Michael Coppedge, one of four principal investigators who have led the five-year effort, the data release promises to “revolutionize” quantitative research on democracy. The dataset includes about 350 fine-grained democracy indicators, 34 mid-level indices, and five high-level indices—marking electoral, liberal, participatory, deliberative, and egalitarian democracy—going back to the year 1900. “We can also look at the consequences of democracy, or lack of democracy, for economic growth, human development, human rights, even big questions of war and peace—many things we really care about,” said Coppedge. With fellow V-Dem researchers Staffan I. Lindberg, University of Gothenburg; Svend-Erik Skaaning, Aarhus University; and Jan Teorell, Lund University, Coppedge co-authored “Measuring High Level Democratic Principles Using the V-Dem Data,” forthcoming in the journal International Political Science Review, which explains how the project measures five varieties of democracy and traces trends in these indices since 1900. There is a wealth of working papers available on the V-Dem site, with new ones added frequently. A number have been coauthored by Coppedge and/or other members of the Kellogg Institute community, including V-Dem co-PI John Gerring, David Altman, and Tiago Fernandes, all former visiting fellows, and Kellogg PhD fellows Fernando Bizzarro Neto and Lucía Tiscornia. As of January 4, the full dataset can be downloaded from the V-Dem website, free of charge. The data are also available for viewing in user-friendly online analysis tools here. An archive of all previous versions of the data, including the coder-level data and uncertainty estimates, is maintained at CurateND, a project of the Hesburgh Libraries at Notre Dame. Coppedge, along with Kellogg Ph.D. fellows Fernando Bizzarro Neto and Lucía Tiscornia and Kellogg research affiliate Benjamin Denison, will lead a V–Dem Data Launch Workshop on Friday, January 22, at Notre Dame, which will be followed by an advanced workshop in February. An international conference to be held at the Kellogg Institute in fall 2016 will provide an early opportunity for researchers beyond the core V-Dem team to present analyses using the data. The V-Dem project has been made possible with funding from Riksbankens Jubileumsfond, the Knut & Alice Wallenberg Foundation, Sweden’s Ministry of Foreign Affairs, the European Commission/EuroAID, the Swedish Research Council, International IDEA, Denmark’s Ministry of Foreign Affairs, the Danish Research Council, the Canadian International Development Agency, NORAD/Norwegian Research Council, and the Quality of Government Institute, with co-funding from the University of Gothenburg and the Kellogg Institute for International Studies and other entities at the University of Notre Dame.